Scilab is usually compared to MATLAB® because their syntax and functionalities are very similar. Scilab differs from other products in the market (e.g. Octave, Maxima) because of its maturity. Actually, Scilab development and maintenance are carefully managed and controlled by the Scilab Enterprises. Scilab also includes Xcos which allows to model and simulate hybrid dynamical systems, such as mechanical, hydraulic, and/or electronic systems. The Openeering team can help you plan and execute your migration to Scilab, through feasibility assessment, training at all levels, conversion of scripts from equivalent products. The team is at your service for optimization and reorganization of existing procedures with the aim of improving efficiency, ease of use, modularity and functionality: contact us for more information, tell us about your problems. The use of Open Source software offers to companies, that already use commercial equivalent products, the chance of significant savings on purchases and renewals of licenses. But exactly how much can you save? To help you answer this question we propose a simple example of Return on Investment using Open Source software. MATLAB® is a registered trademark of The MathWorks, Inc.. | Octave and Maxima software are released under open source GPL license. | Other names may be registered trademarks or trademarks of other companies. 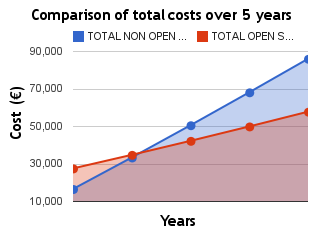 In this page we suggest an example of ROI calculation of Open Source software investment.